Do you know Gna! Software Project Hosting? It's something today similar to SourceForge, GitHub, or Savannah, a place that host many free software projects. You find many projects source codes there, along with all development stuffs (SCM, bugtrack, forum, etc.). The important thing is Gna! supports and hosts only free software projects. Yesterday (Thursday, March 17th) I came across a sad reminder that Gna! will shut down soon. Actually this plan was announced in November 2016, it said "6-months notice before saying goodbye", so it could be this April or May 2017. I show my support to Gna! by this article and I humbly encourage you to support them too by any way you can. Big thanks and respect for Gna! for this 13 years supporting free software. 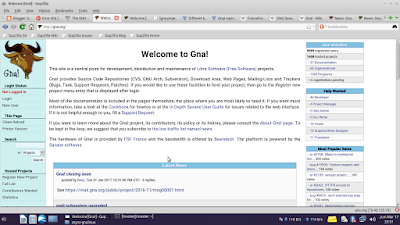 For you new in GNU/Linux community, the shutdown of Gna! Software Project Hosting is like the shutdown of GitHub, GitLab, Sourceforge, or Savannah; a "house" of many free software projects. It means many free software will be gone, because their house's gone. As a consequence, this also means thousands of developers activities on Gna! (bugfixing, coding, mailing list, forum, distribution, etc.) will be stopped. Although there is a solution (e.g. every project could migrate themselves to another "house" like Savannah), of course it would takes extra efforts and times. It's certainly a sad news. I can't help but feel sad with this. I don't know if there will be any good news later (e.g. shut down cancelled), but anyway, I humbly express my respect and huge thanks to all Gna! 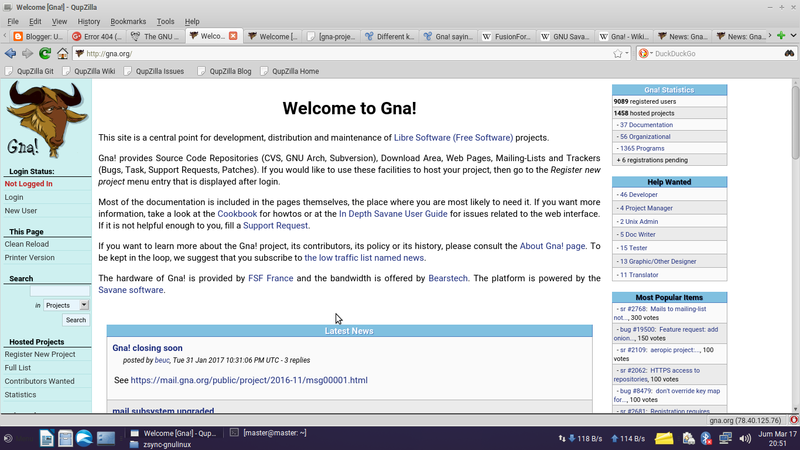 founder and maintainers, as well as all developers hosting their free software on Gna!. Losing Gna! is losing more than 1300 projects and 9000 registered developers and this is a sad news for the community. These 13 years of Gna! will never be forgotten. Thank you for all your hard works. If you have a free software project on Gna!, or if you know your friend does, please consider migrating your project to another free software project hosting such as GNU Savannah. Gna! is a project from FSF France started by the same man built GNU Savannah, Loïc Dachary. Gna! hosts exclusively free software projects. Gna! as a public service started in January 2004 (hence now it's 13 years in serving us) after many circumstances mainly because the GNU Savannah server compromised in 2003. More about Gna! on Wikipedia.